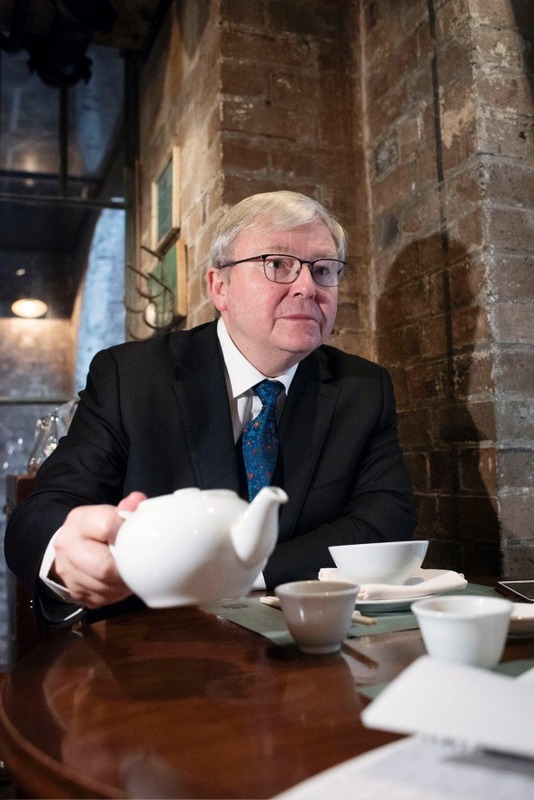 The unforgettable, unmistakeable, round, smiley face of Kevin Rudd appears, bemusedly joking that Mr Wong restaurant in Sydney looks like an attempt to recreate a Shanghai cafe of the 1930s. It’s his first visit and the restaurant wasn’t even Rudd’s choice; it was selected by his staff. Given Rudd’s intense focus on all things Chinese, however, the venue is certainly appropriate. Seeing me already sitting comfortably, he apologises for being late. Actually he’s right on time. He’s clearly a very busy man, our Kevin, even without a frenetic round of appearances in Australia to promote his book: The PM Years. Five years on, the post-PM years have taken Australia’s 26th (times two) prime minister from the claustrophobic confines of Canberra to New York City as K.Rudd – Citizen of the World (despite having been foiled in his ambition to run for his dream job as Secretary-General of the United Nations when then PM Malcolm Turnbull told him the Australian government wouldn’t support his candidacy). 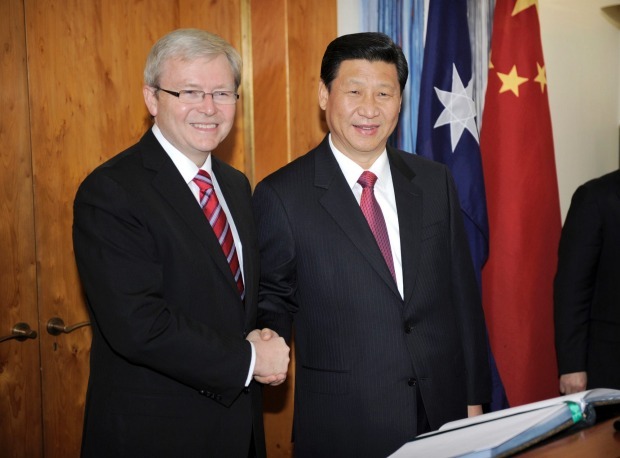 Rudd has been able to parlay his career, his long familiarity with China and his restless intellectual enthusiasms into the presidency of a prestigious US thinktank, The Asia Society Policy Institute, and has built an increasingly global reputation as an expert on Xi Jinping’s China. Right now, that’s a pretty valuable skill to be selling. So last Monday night, Rudd flew from Australia to Tokyo for an Asia Society event followed by talks with members of the Japanese government. Then it was on to Shanghai for a conference on the Chinese economy and to catch up with his daughter, son-in-law and grandchildren. From there, he headed to Singapore to co-chair another conference on the Chinese economy. This coming week, he will be in Jakarta to give a speech on ASEAN and China and the US. He goes to Manila before heading to London for Remembrance Day and to see his Oxford supervisors about his PhD project on China. After that, he’s due to give another speech at a peace summit in Paris called by Emmanuel Macron. Then to another Asia Society event in Zurich on financial system reforms. “There you go, my normal hyperactive self,” he laughs. 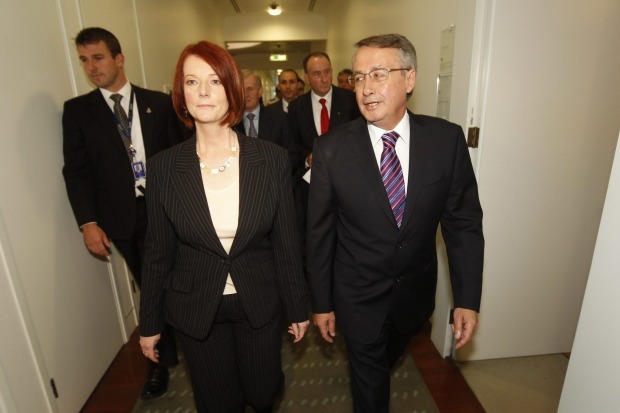 This hyperactivity, love it or hate it, is no longer much in evidence in Australia since Rudd’s exit to a larger stage. Yet there’s still a sense of unfinished business lingering here. Witness the 599-page book written to record his government’s achievements as well as his own “right of reply” to his many critics. 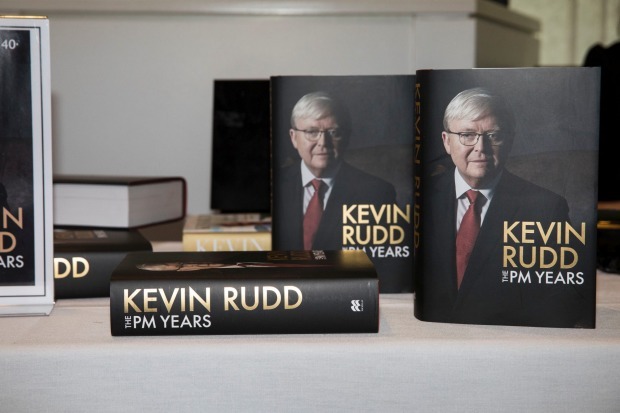 “I wanted to present the alternative narrative of the coup given there had been half a dozen books written by those seeking to construct their own narrative and elevate base ambition to high policy business,” Rudd says pointedly. He takes aim at plenty of targets – and hits many of them hard – in a book notable for his evisceration of several former colleagues. It’s safe to say the book won’t be on Julia Gillard’s or Wayne Swan’s Christmas reading list. “Wayne’s essential problem, a little like Tony Abbott, is that he’s essentially unemployable,” Rudd says not so idly. Ouch. But this also touches on Rudd’s much deeper sensitivity about his own role – past, present and future – representing Australia’s best interests. “Part of the Australian disease is the knee-jerk reaction, against anyone who they think harbours any of the attributes of maybe being a public intellectual, is to engage immediately in the politics and rhetoric of ridicule,” he says, suddenly sounding a little prickly. He also sharply corrects me when I suggest he must appreciate “feeling” relevant in a global context. “Not the feeling of being relevant,” he says. “Being relevant. Subjective land doesn’t actually entertain me. In objective land, we have an objective problem in the relationship between the two biggest countries in the world, both of which I know reasonably well. Perhaps it’s time to try less complex issues – like ordering. 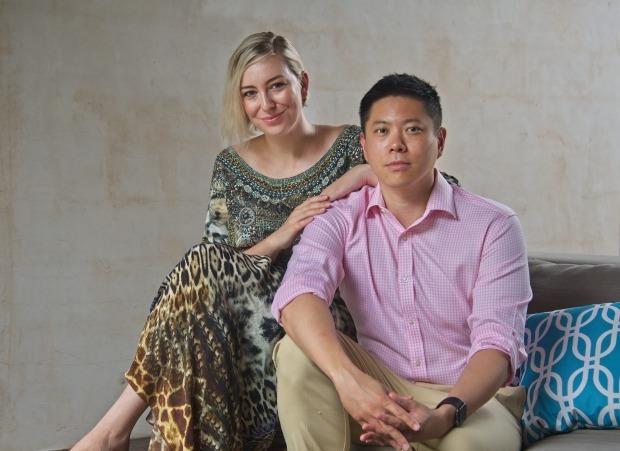 Mr Wong is a large, noisy, popular CBD restaurant – another of the success stories of the Merivale family and Justin Hemmes. We are near large groups of Sydney corporate diners and a trendy bar, sitting at a quieter window table against the exposed red brick wall and overlooking the small lane. “I draw the line at chook’s feet,” Rudd declares. This is the accommodating Rudd, unfazed by the explanation there’s no bok choy or shredded beef on the menu. We order Xiao Long Bao (soup dumplings) – his kids’ and grandkids’ favourite dish, he announces – and happily accept the waiters’ suggestion of half a Peking duck, followed by char sui pork. Rudd’s desire for “greeny things” is satisfied by a serve of broccolini and stir-fried snow peas in oyster sauce. 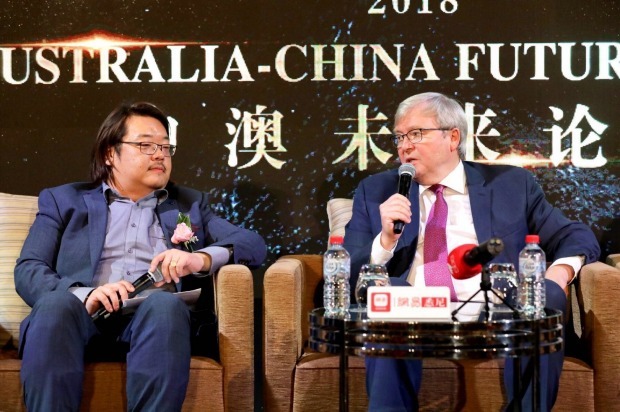 Rudd at the Australia China Future Forum last month. No wine, just Chinese tea, thank you. “We’re Presbyterian,” Rudd adds sotto voce to a totally mystified waiter. Now we have decided on Chinese culinary options, I want the conversational menu to add food for thought on the latest developments in China. It turns out Rudd sees a dramatic change in Beijing’s recent rhetoric, including “remarkable” speeches from Xi, to publicly embrace the crucial role of the private sector again. This means retreating somewhat from the assertion of party influence on private companies and the primacy of state-owned enterprises. According to Rudd, it’s because Chinese authorities realise their economy is slowing far more than they expected . 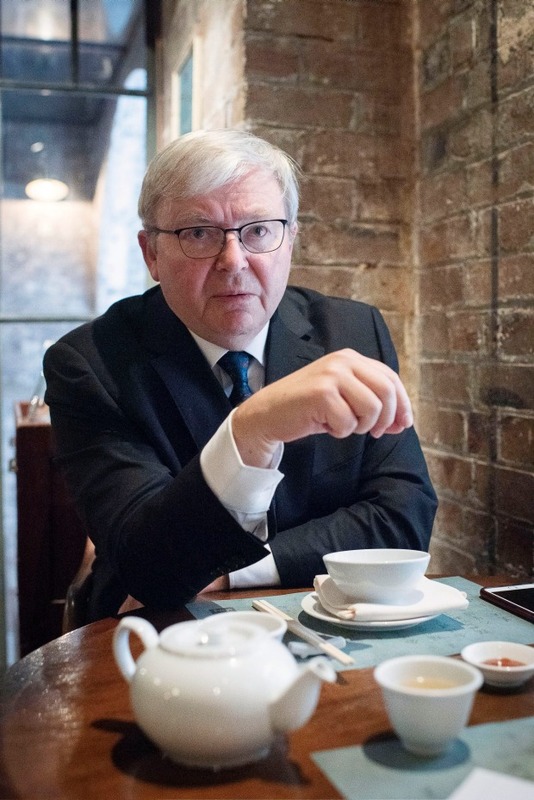 Despite his own long association with China, including learning Mandarin at university and being posted to Beijing as a junior diplomat in the 1980s, Rudd concedes he was not anticipating Xi Jinping’s aggressive reassertion of ideology and increasingly strict political control. “I always knew he was a Chinese nationalist but I was surprised at the extent to which he doubled down into a Leninist past as opposed to a more market-oriented future,” he says. There’s a slight pause as Rudd also expresses surprise at how hot the dumplings are on the inside. He cautions me. But, of course, the other burning ingredient in any modern Chinese equation is the impact of US policy under Donald Trump – backed by a much changed American strategic perception of China. “What is remarkable in the US is that this is bipartisan, across agencies, between the administration and businesses, and including large slices of academia and NGOs,” Rudd says. “What has happened is that we are now at a stage when the Americans have defined a shift from strategic engagement to strategic competition. That means he sees a key challenge for the US and China is to develop new rules of the game after four decades of having the previous rules of engagement basically understood by both. This seems the right time for the arrival of the half Peking duck, with more bite-sized ingredients to be maneuvered neatly into the pancakes we are sharing. Rudd turns out to more adept at this than I am as he expresses firm views with no hesitation in his use of either chopsticks or sentences. By this stage of a bracing lunch, the duck is well eaten and the sliced pork is about to arrive, closely followed by “greeny things” and a small steamed rice. My appetite is fading more rapidly than the conversation. It’s a definite no to the prospect of dessert. I still can’t help but ask Rudd’s views on how well Australia is playing in this complicated big power game and its uncertain results. He declares former prime ministers shouldn’t be providing advice on every strategic issue the government faces. Naturally, that doesn’t stop him enunciating a “set of general principles”. The first is Australia should never allow itself to be talked into any “binary” strategic or economic choice by either the US or China. “That’s a fool’s game,” he insists, arguing it’s no coincidence both Japan and India are in the process of re-establishing better relations with China as they to try to balance the contradictory forces of the Trump-Xi era. “The second principle for Australian governments of whatever political persuasion is that China respects strength and is contemptuous of weakness.” His particular ire is directed at what he calls Turnbull’s “flip, flop, flap” approach in being strongly critical of Chinese influence in Australia last December then retreating to what he derides as a “Isn’t China nice?” speech after six months of Australia being put in the deep diplomatic freeze by Beijing. “The Chinese government concluded from this that the Australian government under Turnbull was weak,” he says. This, of course, brings him to his third principle: that an Australian government should be prepared to say no to China on important issues but to demonstrate this by actions rather than by “impetuous, declaratory” rhetoric. In contrast, he suggests, he has been talking consistently over decades about the need for a China-literate Australia and engaging the US and China in a common strategic framework in East Asia. He recites several of them. But it’s 2pm. Time to be up and away to another interview before a panel discussion on the global financial crisis at Sydney’s Town Hall with former Treasury secretary and now NAB chair Ken Henry. 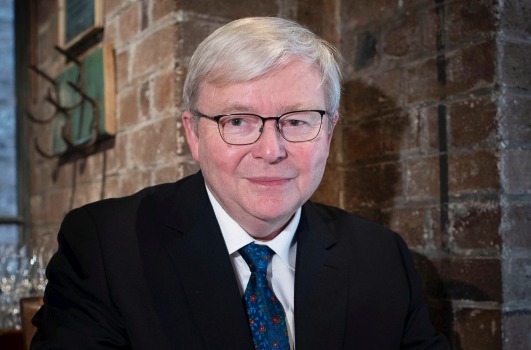 Just another day in the life of the existential Kevin Rudd.